Background: Amylase catalyzes the breakdown of long-chain carbohydrates to yield maltotriose, maltose, glucose and dextrin as end products. It is present in mammalian saliva and helps in digestion. Objective: Their applications in biotechnology include starch processing, biofuel, food, paper, textile and detergent industries, bioremediation of environmental pollutants and in clinical and medical applications. The commercial microbial strains for production of α-amylase are Bacillus subtilis, B. licheniformis, B. amyloliquefaciens and Aspergillus oryzae. Industrial production of enzymes requires high productivity and cannot use wild-type strains for enzyme production. The yield of enzyme from bacteria can be increased by varying the physiological and genetic properties of strains. Results: The genetic properties of a bacterium can be improved by enhancing the expression levels of the gene and secretion of the enzyme outside the cells, thereby improving the productivity by preventing degradation of enzymes. Overall, the strain for specific productivity should have the maximum ability for synthesis and secretion of an enzyme of interest. Genetic manipulation of α-amylase can also be used for the production of enzymes with different properties, for example, by recombinant DNA technology. Conclusion: This review summarizes different techniques in the production of recombinant α- amylases along with the patents in this arena. The washing out of enzymes in reactions became a limitation in utilization of these enzymes in industries and hence immobilization of these enzymes becomes important. This paper also discusses the immobilization techniques for used α-amylases. 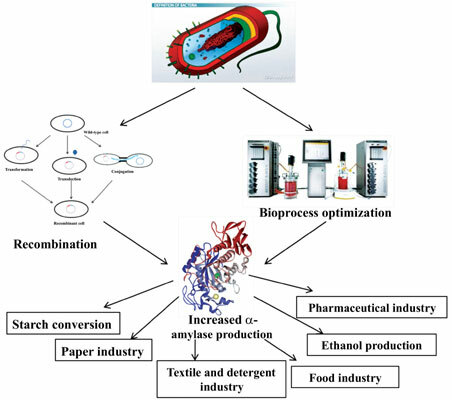 Alpha-amylase, recombinant enzymes, bioprocess considerations, immobilization, experimental design, production.